Maybe it’s just the kids at my house, but during the summer, everyone is SO HUNGRY all the time. I’m sure it’s some combination of all the extra activity (swimming, parks, splash pads, etc.) and boredom, and heat that threatens to cook us alive. 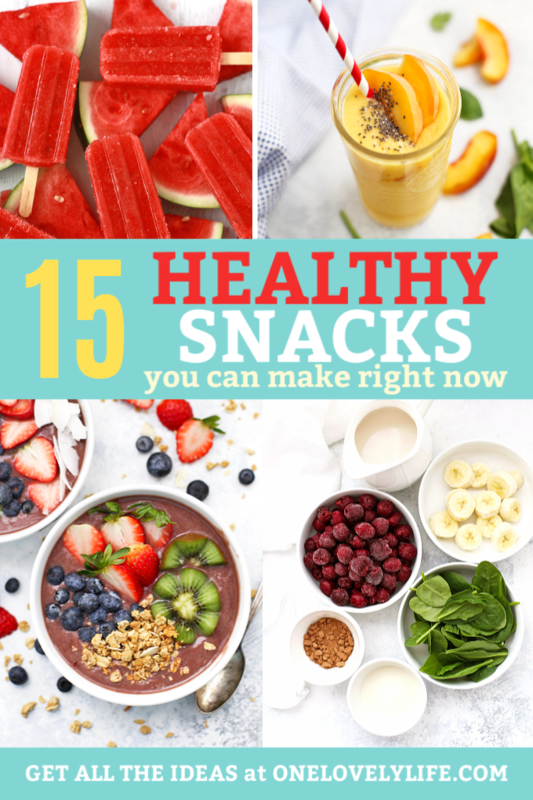 We have lots of favorites, and plenty of store-bought snacks we eat (my kids love chia bars, gluten free pretzels, and fruit leather), but especially during the summer, we make a lot of our own snacks. It gives us a chance to enjoy things that don’t work on a school day (our school eats a snack during the day, so we can’t send anything with nuts, or things like a popsicle or smoothie). 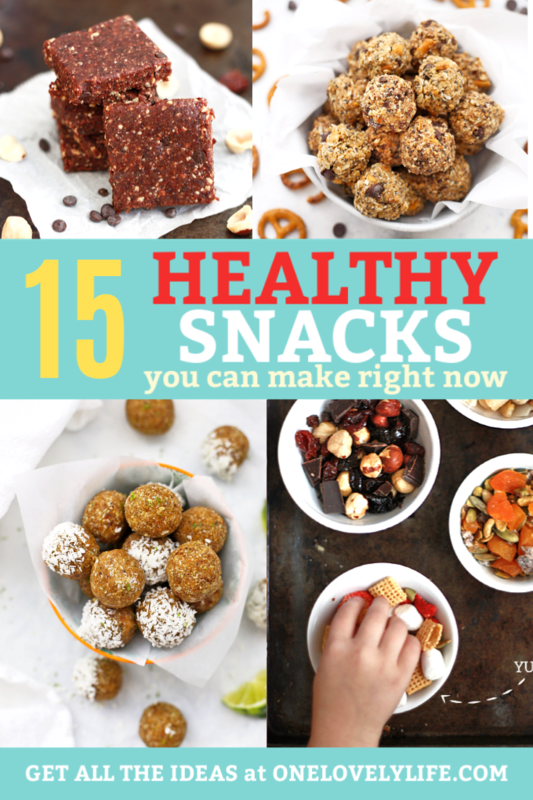 Making our own snacks also gives us something to do, helps us try new options, and keep things fresh. 1. Popsicles – (You knew I was going to say popsicles, didn’t you?) These are SO much fun and every single one is delicious. All you need is a popsicle mold, then you can get started with all my favorite popsicle recipes here. 2. Chocolate Cherry Smoothie – I always feel like The Nice Mom when I make these. My kids feel like they’re having a chocolatey treat, and I know that sneaky smoothie is hiding plenty of spinach. They taste SO GOOD. 4. Acai Bowls – The fun part with an acai bowl is topping it with all kinds of goodies–granola, fresh fruit, nuts, coconut, etc. Don’t be afraid to get creative! My kids LOVE making a pretty little bowl to eat. 5. Creamy Kale Vanilla Smoothie – This is Milo’s favorite green smoothie. It tastes like a vanilla milkshake (and I don’t say that lightly). It’s creamy and thick, sweet and silky. We love it. Any of the energy bars can be rolled into energy balls if your prefer, and vice versa. When I have kids in the kitchen with me we almost always make energy balls because they love helping scoop and roll them out. Don’t forget to check out the trail mix options, too! 6. Nut Free Coconut Lime Energy Bites – Most of my energy bite recipes have chocolate of some kind, so these are such a nice change of pace. They taste really light and fresh, and they are amazingly sweet for having no added sweetener. 7. Almond Joy Bars – I won’t begin to claim that these taste just like the candy bars. (They don’t.) But they do have an almond joy vibe I just love. A yummy combination of almond, coconut, and chocolate, they’re delicious, and really scratch the itch for something sweet. 8. Chocolate Cherry Hazelnut Bars – These are my all-time favorite energy bars or bites. The combination of flavors is incredible and they feel like eating little truffles. SO, so good. ps – If you like hazelnuts, you’d LOVE these Nutella energy bites. They’re unreal! 9. Trail Mix for the Week – My kids LOVE trail mix. We have enough different things on hand that they can cobble together something different (though they tend to each have their favorites). This post has several different suggested combinations, plus plenty of ideas to come up with your own! 10. Sweet & Salty Peanut Butter Pretzel Energy Bites – These are one of our favorites. Admittedly, not as healthy as some of the other energy bite options we have, but they’re fun to make and even more fun to eat. That sweet-salty combo gets me every time! 11. Almond Butter 3 Ways – I almost always have a batch of flavored almond butter (or peanut butter or cashew butter) in my refrigerator. I flavor them myself, so I always know what’s inside. I can never decide which flavor I love best–Honey-Vanilla, Chocolate, or Cinnamon. They’re all good! 12. Creamy Avocado Ranch – This is my desert island condiment. If I could only eat one dip for the rest of my life, this is it. It’s velvety smooth and tastes delicious on ALL the things–veggies, crackers, turkey, wrap sandwiches, and so much more. 13. The BEST (Paleo & Whole30) Ranch Dressing – This takes under 2 minutes to whip up and lasts for a week. It’s so great on veggies, salads, wraps, and more. Plus, if you need a little variety, you can always make Chipotle Ranch (which is so-o-o-o-o good). 14. Artichoke and Olive Hummus – My hummus of choice lately. I love the salty olives and the creaminess from the artichokes. It’s fantastic on veggies, in wraps, or with crackers. (There’s also a video in the post that shows how easy it is!). 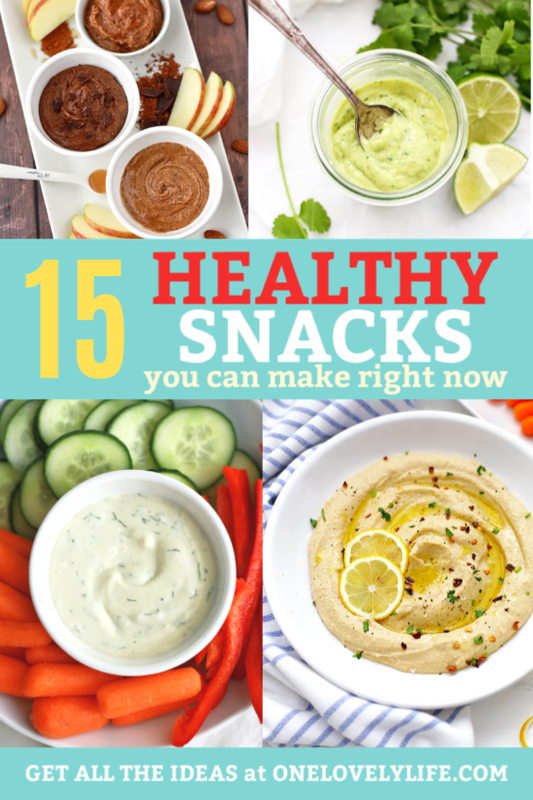 If olives aren’t your jam, you can try Roasted Red Pepper Humus, Lemon Hummus, or Cilantro Jalapeño Hummus. 15. Citrus Avocado Dip – this is such a staple for me. You can make it and freeze it (!) to pull out whenever you like, whether that’s for tacos, lunch bowls, or snack time. It’s awesome on any kind of veggies, but it’s also great with a little protein. I sometimes spoon some onto turkey slices and roll them up like little taquitos. 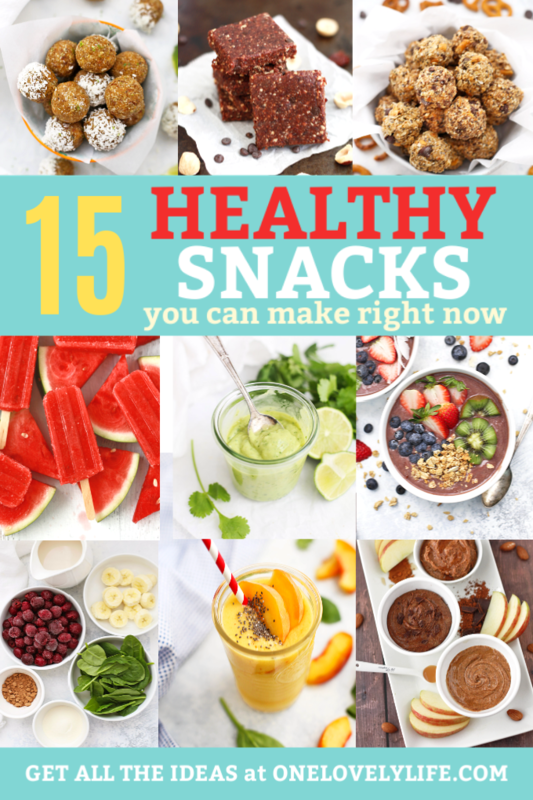 What are your favorite healthy snacks right now? I love some tasty inspiration! P.S. Looking for more inspiration? I send out recipes, tips, menu ideas, favorite things and more in my weekly newsletter. Sign up here so you don’t miss out! We’ve made your chocolate cherry hazelnut bars a few times and they’re a favorite in our house! I can’t wait to try that mango smoothie bowl! Thank you — this is a great roundup. Can’t wait to try that Paleo/Whole30 ranch dip. My son has a milk protein allergy and I’m nursing, so I can’t eat any dairy….and I miss ranch dressing, among other things! Oh, I totally understand! Having a good ranch on hand makes being dairy free SO much more bearable!